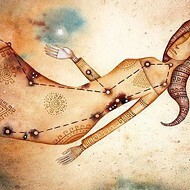 ARIES (March 21-April 19): What are the sources that heal and nourish you? Where do you go to renew yourself? Who are the people and animals that treat you the best and are most likely to boost your energy? I suggest that in the coming week you give special attention to these founts of love and beauty. Treat them with the respect and reverence they deserve. Express your gratitude and bestow blessings on them. It’s the perfect time for you to summon an outpouring of generosity as you feed what feeds you. TAURUS (April 20-May 20): Why do birds fly? First, that’s how they look for and procure food. Second, when seasons change and the weather grows cooler, they may migrate to warmer areas where there’s more to eat. Third, zipping around in mid-air is how birds locate the materials they need to build nests. Fourth, it’s quite helpful in avoiding predators. But ornithologists believe there is yet another reason: Birds fly because it’s fun. In fact, up to 30 percent of the time, that’s their main motivation. In accordance with the astrological omens, Taurus, I invite you to match the birds’ standard in the coming weeks. See if you can play and enjoy yourself and have a good time at least 30 percent of the time. GEMINI (May 21-June 20): Is there an important resource you don’t have in sufficient abundance? Are you suffering from the lack of an essential fuel or tool? I’m not talking about a luxury it would be pleasant to have or a status symbol that would titillate your ego. Rather, I’m referring to an indispensable asset you need to create the next chapter of your life story. Identify what this crucial treasure is, Gemini. Make or obtain an image of it, and put that image on a shrine in your sanctuary. Pray for it. Vividly visualize it for a few minutes several times a day. Sing little songs about it. The time has arrived for to become much more serious and frisky about getting that valuable thing in your possession. CANCER (June 21-July 22): Since 1981, Chinese law has stipulated that every healthy person between the ages of 11 and 60 should plant three to five trees per year. This would be a favorable week for Chinese Cancerians to carry out that duty. For that matter, now is an excellent time for all of you Cancerians, regardless of where you live, to plant trees, sow seeds, launch projects, or do anything that animates your fertility and creativity. You now have more power than you can imagine to initiate long-term growth. 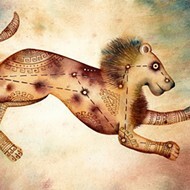 LEO (July 23-Aug. 22): The weeks preceding your birthday are often an excellent time to engage the services of an exorcist. But there’s no need to hire a pricey priest with dubious credentials. I can offer you my expert demon-banishing skills free of charge. Let’s begin. I call on the spirits of the smart heroes you love best to be here with us right now. With the help of their inspirational power, I hereby dissolve any curse or spell that was ever placed on you, even if it was done inadvertently, and even if it was cast by yourself. Furthermore, the holy laughter I unleash as I carry out this purification serves to expunge any useless feelings, delusional desires, bad ideas, or irrelevant dreams you may have grown attached to. Make it so! Amen and hallelujah! VIRGO (Aug. 23-Sept. 22): You know what it’s like to get your mind blown. And I’m sure that on more than one occasion you have had your heart stolen. But I am curious, Virgo, about whether you have ever had your mind stolen or your heart blown. And I also wonder if two rare events like that have ever happened around the same time. I’m predicting a comparable milestone sometime in the next three weeks. Have no fear! The changes these epiphanies set in motion will ultimately bring you blessings. Odd and unexpected blessings, probably, but blessings nonetheless. P.S. : I’m sure you are familiar with the tingling sensation that wells up in your elbow when you hit your funny bone. Well, imagine a phenomena like that rippling through your soul. LIBRA (Sept. 23-Oct. 22): Since 2008, Marvel Studios has produced nine movies based on characters from Marvel Comics. They’re doing well. The Avengers earned $1.5 billion, making it the third-highest-grossing film of all time. Iron Man 3 brought in over a billion dollars, too, and Thor: The Dark World grossed $644 million. Now Marvel executives are on schedule to release two movies every year through 2028. I’d love to see you be inspired by their example, Libra. Sound fun? To get started, dream and scheme about what you want to be doing in both the near future and the far future. Then formulate a flexible, invigorating master plan for the next 14 years. SCORPIO (Oct. 23-Nov. 21): While in Chicago to do a series of shows, comedian Groucho Marx was invited to participate in a séance. He decided to attend even though he was skeptical of the proceedings. Incense was burning. The lights were dim. The trance medium worked herself into a supernatural state until finally she announced, I am in touch with the Other Side. Does anyone have a question? Groucho wasn’t shy. What is the capital of North Dakota? he asked. As amusing as his irreverence might be, I want to use it as an example of how you should NOT proceed in the coming week. If you get a chance to converse with higher powers or mysterious forces, I hope you seek information you would truly like to know. SAGITTARIUS (Nov. 22-Dec. 21): In one of her poems, Adrienne Rich addresses her lover: That conversation we were always on the edge / of having, runs on in my head. 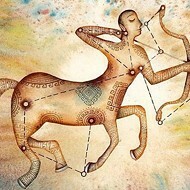 Is there a similar phenomenon in your own life, Sagittarius? Have you been longing to thoroughly discuss certain important issues with a loved one or ally, but haven’t found a way to do so? If so, a breakthrough is potentially imminent. All of life will be conspiring for you to speak and hear the words that have not yet been spoken and heard but very much need to be. CAPRICORN (Dec. 22-Jan. 19): This would be a fun time for you to brainstorm about everything you have never been and will never be. I encourage you to fantasize freely about the goals you don’t want to accomplish and the qualities you will not cultivate and the kind of people you will never seek out as allies. I believe this exercise will have a healthy effect on your future development. It will discipline your willpower and hone your motivation as it eliminates extraneous desires. It will imprint your deep self with a passionate clarification of pursuits that are wastes of your precious energy and valuable time. AQUARIUS (Jan. 20-Feb. 18): Expect nothing even as you ask for everything. Rebel against tradition with witty compassion, not cynical rage. Is there a personal taboo that no longer needs to remain taboo? Break it with tender glee. Do something playful, even prankish, in a building that has felt oppressive to you. Everywhere you go, carry gifts with you just in case you encounter beautiful souls who aren’t lost in their own fantasies. You know that old niche you got stuck in as a way to preserve the peace? Escape it. At least for now, live without experts and without leaders -- with no teachers other than what life brings you moment by moment. PISCES (Feb. 19-March 20): Every year, the U.S. government spends $25,455 per capita on programs for senior citizens. Meanwhile, it allocates $3,822 for programs to help children. That’s only 15 percent as much as what the elders receive. In the coming weeks, Pisces, I believe your priorities should be reversed. Give the majority of your energy and time and money to the young and innocent parts of your life. Devote less attention to the older and more mature aspects. According to my reading of the astrological omens, you need to care intently for what’s growing most vigorously.